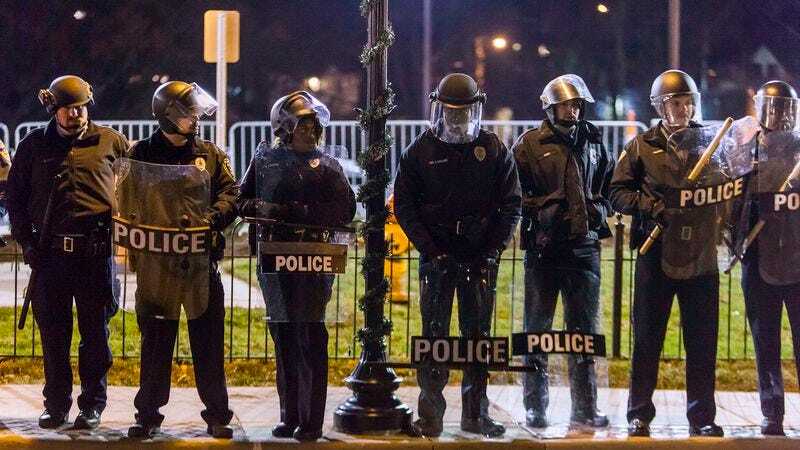 FERGUSON, MO—Ahead of a grand jury’s decision over whether to indict officer Darren Wilson in the shooting death of unarmed black teenager Michael Brown, police in the city of Ferguson have reportedly heavily increased their presence this week to ensure residents are adequately provoked. “We’ve deployed additional officers throughout Ferguson in order to make absolutely certain that residents feel sufficiently harassed and intimidated,” said St. Louis County police chief Jon Belmar, assuring locals that officers in full riot gear will be on hand to inflame members of the community for as long as is necessary. “It’s absolutely essential that the people of Ferguson have full confidence that law enforcement is committed to antagonizing them every step of the way.” At press time, the Missouri National Guard was on standby with tanks and urban assault vehicles in case Ferguson residents required additional incitement.